The Northwest K9 Bed Bug Detectives team recognizes that a bed bug infestation is a sensitive and difficult pest issue to deal with. An infestation can also go undetected for months, and all the while, your family and your pets are being fed on at night. Left alone, bed bug infestations can rapidly escalate into a major problem that can threaten the well-being of your family and any overnight visitors to your home. 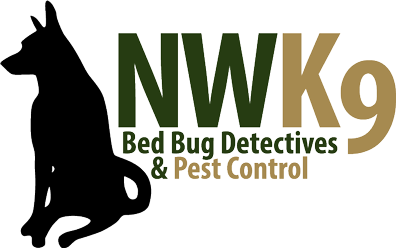 If you suspect that you may have bed bugs in your home, do not hesitate to contact Northwest K9 Bed Bug Detectives, and schedule your free inspection now! Determine the size and scope of the problem if an infestation is present. Educate residents about the pest and the available treatment options. Review bed bug treatment methods and provide a customized treatment plan to eliminate the infestation. Monitor the situation on an ongoing basis, gather information, and, if requested, follow up with a canine inspection. Provide information on prevention products and tools for ongoing prevention. We pride ourselves in offering Seattle the safest in green and pesticide-free bed bug treatments. Learn more about your alternative treatment options here on our site, or contact a member of our team to find answers to your questions. Northwest K9 Bed Bug Detectives is here to offer pest control and extermination services to all homes and offices in Seattle and the surrounding areas. Contact us today for a free inspection!